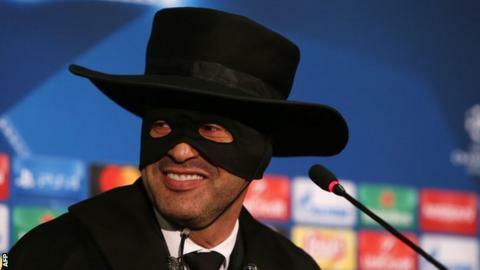 Shakhtar Donetsk boss Paulo Fonseca celebrated his team's 2-1 Champions League victory over Manchester City by wearing a Zorro mask. The Ukrainian side inflicted City's first defeat in 29 matches to secure their place in the last 16 as Group F runners-up behind Pep Guardiola's side. Fonseca had said he would dress up as Zorro - a fictional masked vigilante - if Shakhtar advanced. The Portuguese wore a mask, hat and cape at his post-match news conference. "This is the most joyful press conference of my career," Fonseca, who was recently linked with the Everton job, said. "I feel great joy. I think not only Shakhtar's supporters but all Ukrainians have to be proud of our team."